Congratulations to the finalists and winners of the first ever Student Media FlashLab Innovation Pitch Contest. The competition ended Nov. 29 with four Kent State students sharing a prize of $1000. Each winning idea will also share up to $10,000 from the Student Media Innovation Fund in order to launch, test and maintain their ideas in the coming months. The winners of the contest include Carter Adams, a junior journalism major who won first place and plans to implement a safety/security workshop for journalists; second place winner Natalie Meek, a senior public relations major who created an idea to partner with a public relations team with Student Media in order to drive up student engagement with improved marketing and promotion, and third place winners senior journalism major Cameron Gorman and junior digital media production major Anna Katsas who plan on introducing augmented reality into the upcoming spring issue of Luna Negra. 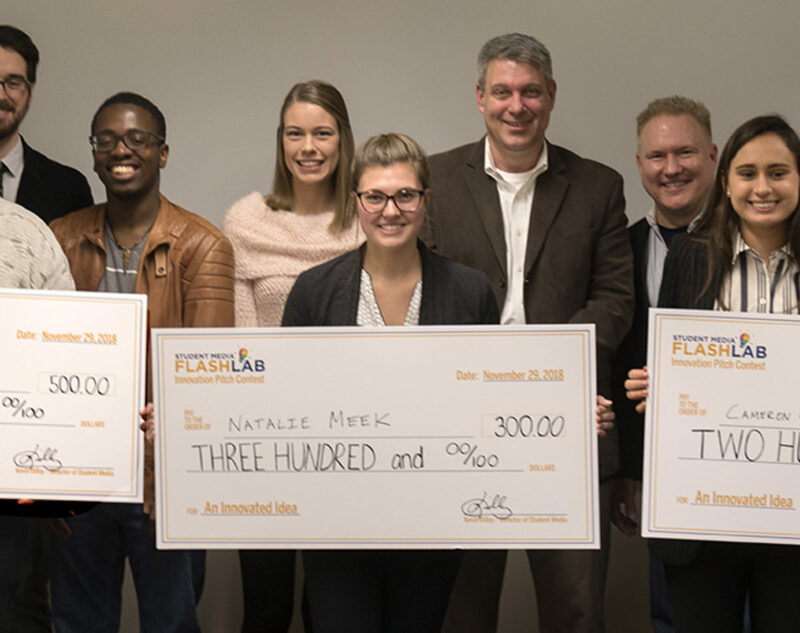 Student Media FlashLab, a Kent State Student Media innovation initiative, strives to foster and support student-driven innovation in content creation, revenue generation and audience engagement. Seven finalists presented their final pitches to a panel of three judges: Craig James, partner and co-founder of Catalyst Strategies, Zach Mikrut, the program manager at LaunchNET Kent State, and Nicole Bitskay, a sophomore human development and family studies major who recently placed first in LaunchNET’s Elevator Pitch competition.